Born on the 27th October 1920, Muriel Sauer’s feet were often high above the ground. The effect was thrilling, and whilst high cliffs and mountains were still some distance off, Muriel satisfied her desire for adventure by climbing over the rocks and trees close to her childhood home. The views, the freedom and exhilaration were an inescapable draw for Muriel as a young girl, and the thought of treading close to danger made the experience all the more vivid. Yet in later life Muriel saw the flip side, as a founding member of the Borrowdale Mountain Rescue Team. Few women climbed in the 1940s and even fewer had Muriel’s confidence. Her early exploits in the tree canopy provided a perfect starting point for a life of climbing, and Northumberland’s open expanse was an escape from Newcastle’s urban landscape. Yet the war halted all such thoughts upon her return, and it was not until 1947 that Muriel was finally able to return to climbing. She formed a long term partnership with close friend Joan Edwards and the pair could often be seen on Crag Lough in Northumberland. With no car they would cycle to and fro from Newcastle, climbing so late into the evening that they often stayed in the local Youth Hostel. The two were inseparable and not phased by the lack of equipment at the time. Helmets didn’t exist, ropes were made from hemp, and they wore plimsolls on their feet. Yet under such limitations they learnt to climb safely and trusted each other entirely. From Northumberland their horizons broadened to the Lake District and Scotland, where they applied all they’d learnt against a grander backdrop. Yet their approach remained simple. Evenings were spent in barns and hostels, anywhere they might rest their heads cheaply and comfortably. Whilst with no carabiners or harnesses, they snaked the rope over and round protrusions found on route. In this way Muriel and Joan accomplished a great number of routes in the Langdales, Wasdale as well as the Cullin Ridge. The two also remained true to their Northumbrian roots, stubbornly cycling the 80 odd miles for their long weekends to the Lake District and hitching in vans and lorries for their escapes to the Highlands. Drawn ever closer to the Lake District, Muriel married in the late 1940s and moved to Keswick. There they began to hear word that a local rescue organisation was being proposed by Penrith born climber Colonel Horace (Rusty) Westmorland. Whilst the mountains had provided Muriel a chance for adventure, it was quickly becoming apparent of what might happen if things go wrong. In 1946 Wilfrid Noyce was rescued with a broken femur on Great Gable’s Tophet Wall. Then a year later in 1947, two climbers died on Whelpside Gill, and a large scale search operation was launched for two children who went missing in Thornthwaite. Thankfully they turned up later the next day. The decision was made around this time that an official rescue body was needed, and under the guidance of Colonel Westmorland, Borrowdale Mountain Rescue Team (now Keswick) formally came into being. An early meeting was held at the Royal Oak in 1948 and applications for prospective members began to be submitted. As locals at the time, Muriel and her husband were amongst those first founding members, and the years of experience that Muriel had learnt were put into practice. Her ease and comfort of being at height made her an ideal candidate, and during her time in Keswick she became a key part of the team. Early photos from Great Gable show Muriel in her element. It is striking to see her as the only women in the team at the time, yet she confidently earned her place in the team. 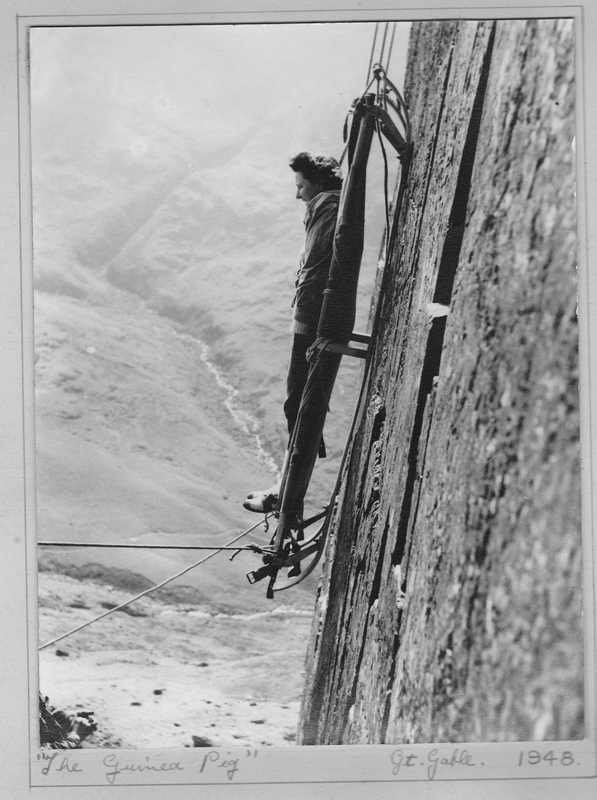 Training sessions were often as complex and committing as the rescues themselves, and Muriel took this with ease, happy at being lowered vertically off the side of Great Gable during one such session. Techniques have developed since then, but the thread of history in the Keswick team is profound. On the walls of their headquarters hang a number of images from the team’s early days. Muriel is unique amongst them as an early pioneer of women’s involvement in Mountain Rescue. This was recognised in 2017, when Muriel returned to Keswick MRT to meet with current members and share her own experiences of its formation. After her years in Cumbria, Muriel returned with her family to Northumberland in her 50s and still lives there to this day. Yet her involvement with mountain rescue is profound and long lasting. A lifelong passion for the mountains and her unique experiences of mountaineering with her climbing partner Joan gave her the ability to match her male counterparts and contribute greatly to the service that mountain rescue volunteers continue to provide to this day.